Kamchatka is a country not only fire-breathing mountain. 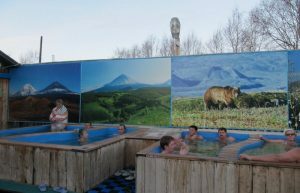 One of the amazing phenomena of Kamchatka nature — hot springs. Each source is unique in its composition and the influence exerted on the human body. Zelenovskie lakes — a health center, which consists of 10 individual radon baths, a large swimming pool with mineral water and pure lakes. The temperature of the bath can be adjusted on your own. The use of bath facilitates the work of the heart, promote healing of damaged skin, eliminate toxins from the body. Baths have anti-inflammatory, resolving, soothing and desensitizing effect. Visiting this place will give you unforgettable pleasure, -ved a nice warmed in the bath icy dip in the lake! Pep and health — guaranteed !!! — Return to the city. Tour price: 2 000 rubles from the 1st. people. bathing suit, sunglasses, insect repellent (protection against blood-sucking insects) ,, a small backpack for personal belongings, photo video equipment.